Nintendo's own Shigeru Miyamoto has admitted that the company didn't expect the world of high definition to be so resource-intensive. While Sony and Microsoft perpetuate the console hardware arms race, Nintendo is generally content to do its own thing. Still, now that HD graphics are all but expected, the big N has had to get with the times and go high-def with the Wii U. Unfortunately for the company, its policy of ignoring the squabbles of the competition means that it didn't learn from their mistakes, and now Wii U development is suffering. In a translated Q&A session with investors, senior managing director Shigeru Miyamoto explained that Nintendo underestimated the cost of developing in HD. 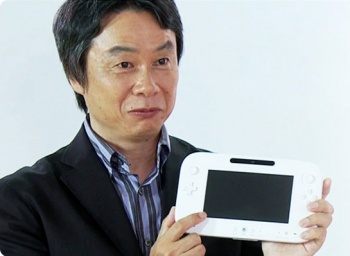 "When it comes to the scale of software development, Wii U with HD graphics requires about twice the human resources than before," says Miyamoto. "Please allow me to explain that we may have underestimated the scale of this change and as a result, the overall software development took more time than originally anticipated just as we tried to polish the software at the completion phase of development. However, we are almost out of this phase." Miyamoto is currently in charge of Pikmin 3, which was intended to be release around the time of the Wii U's launch but has been continually delayed - perhaps in large part due to this mistake. It seems that Nintendo still has a lot to learn if the Wii U aims to compete with its HD rivals.